If you’re looking for a 241-page, beautifully illustrated, expertly researched book chronicling the history of Han Solo, Star Wars Icons: Han Solo by Gina McIntyre is it. But that’s not all that makes the book so great. The book follows the character of Han Solo from beginning to end, from every angle imaginable, with insight from not just the author but the people directly involved. People like Harrison Ford himself, Lawrence Kasdan, Alden Ehrenreich, Mark Hamill, Peter Mayhew, J.J. Abrams and many others. Basically everyone you can think of besides George Lucas and the late Carrie Fisher. McIntyre dives deep behind the scenes of the Star Wars films, gets into the comic books, novels, Expanded Universe, new canon, video games, prequels, sequels, you name it, all the way up to and including The Last Jedi and Solo: A Star Wars Story. But, as fascinating as all that is, again, that’s not what makes the book so excellent. What makes the book so excellent are the little things. The fact it goes the extra mile. That on a page talking about early Han Solo merchandise, there’s literally a piece of early Han Solo merchandise (in the form of a sticker). 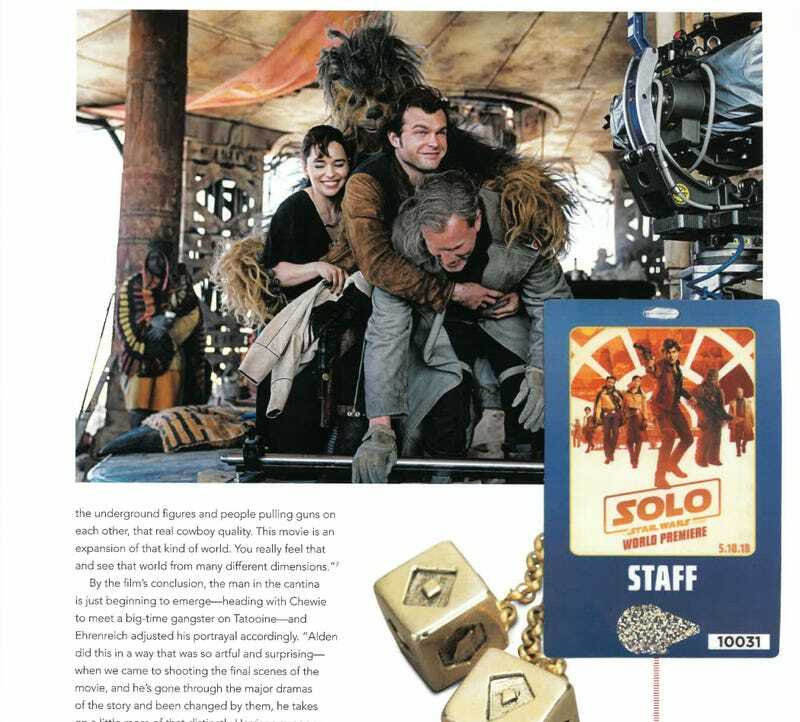 That in the section about the release of Solo: A Star Wars Story, there’s a replica badge from the premiere of Solo: A Star Wars Story. That in order to convey how concept art is translated into reality, the book regularly includes an extra element glued on top of the normal page, for the reader to flip and examine with their own hands. Then there are the incredible photos. Some of them you’ve seen before, of course. But others feel new and fresh because either they are, or because they’re alternate versions of those familiar pictures. An image snapped a few seconds after the other one from the same photo shoot. Or a quick glimpse at what was happening between takes on a classic scene. The whole book lets the reader look at Han Solo and Star Wars both as we know them, and also from a slightly alternative perspective. Here are just a few of things we love from the book. 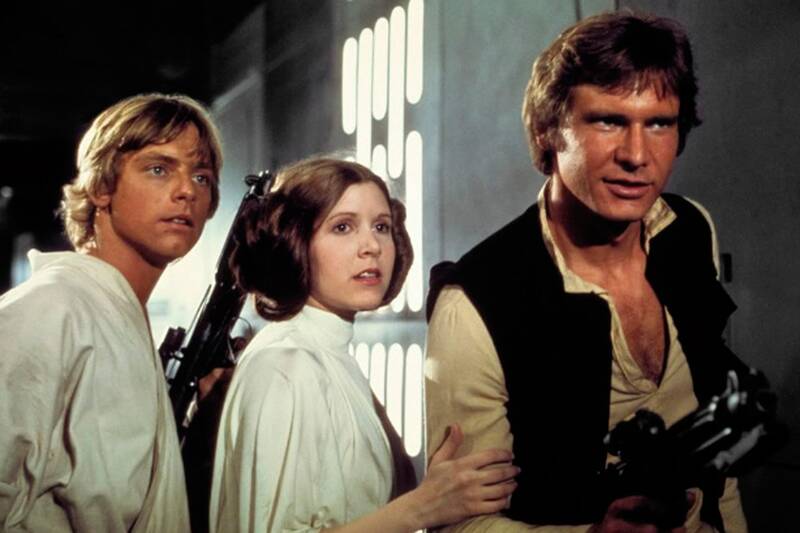 Star Wars Icons: Han Solo works chronologically. So, during the section about the development of the first film, we see things like Ralph McQuarrie’s original design of the Millennium Falcon set on top of the final design. To show things like this, we’ve created GIFs. Page 27 of Star Wars Icons: Han Solo. 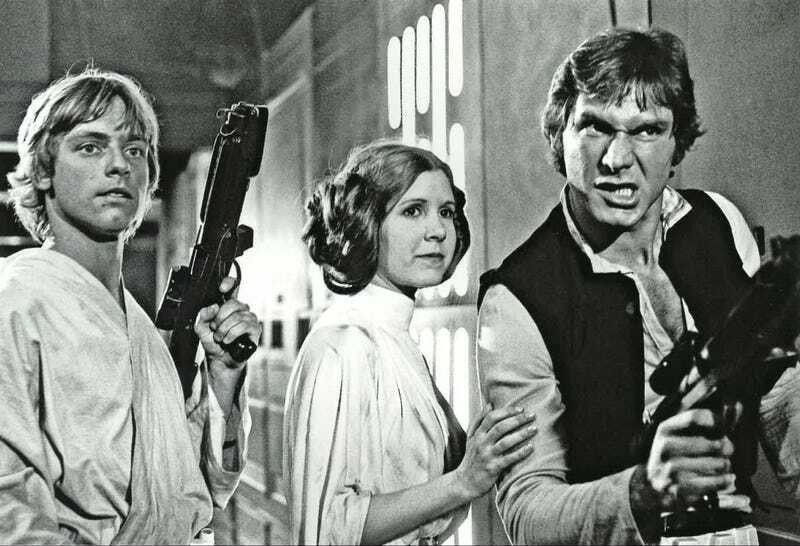 Everyone knows this iconic image of Han, Leia, and Luke. But as we mentioned, this book gives you recognisable photos with a twist. So here’s one maybe you haven’t seen from the set of A New Hope. An image from page 42 of Star Wars Icons: Han Solo. We’ve seen this famous promo shot of Han and Chewie in front of the Millennium Falcon. But have you ever seen the whole photo shoot? The book has a bunch of them in a fold-out section. Page 49 of Star Wars Icons: Han Solo. As mentioned above, when there’s a chapter about merchandise, sometimes, the book has actual merchandise in it. And though this is a scan, this sticker is in the book and can be used. The top of page 61 in Star Wars Icons: Han Solo. 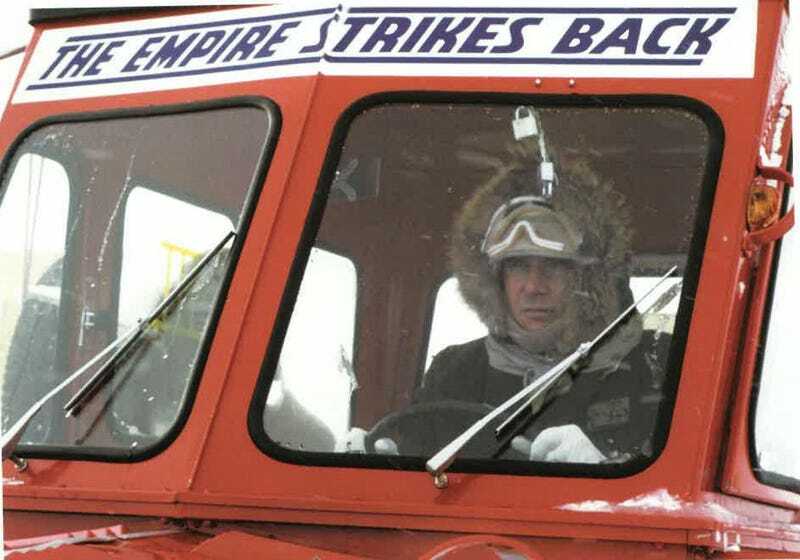 Moving on to The Empire Strikes Back, you get great behind the scenes shots like this one of Harrison Ford driving a snow vehicle. A photo from page 76 of Star Wars Icons: Han Solo. Here’s a flap that shows how director Irvin Kershner took a storyboard and interpreted it for the film. Page 80 in Star Wars Icons: Han Solo. 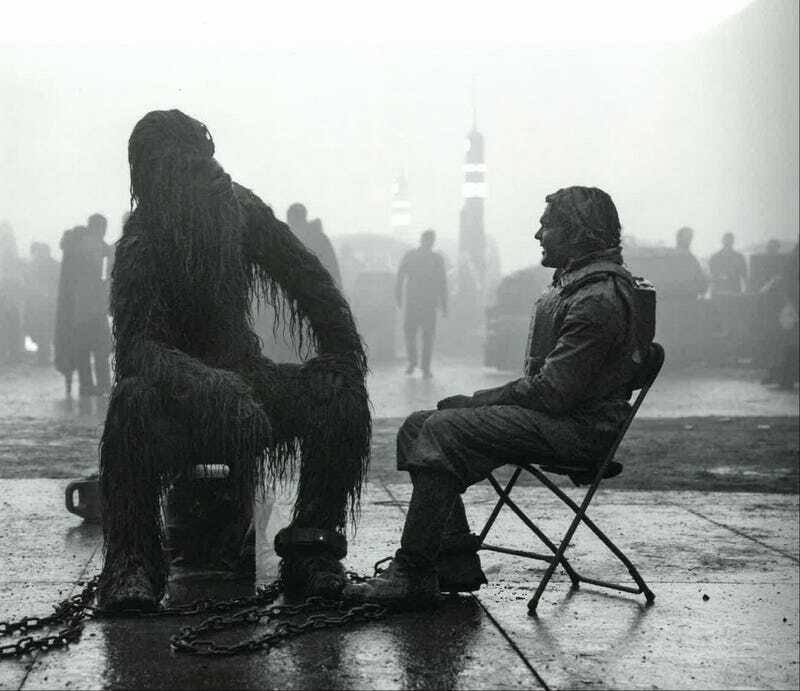 There are so many incredible photos, like this one of Ford hanging out while shooting the carbonite scene. A photo from page 91 of Star Wars Icons: Han Solo. When the book talks about a Star Wars radio script, not only does it provide one script page, it provides two. 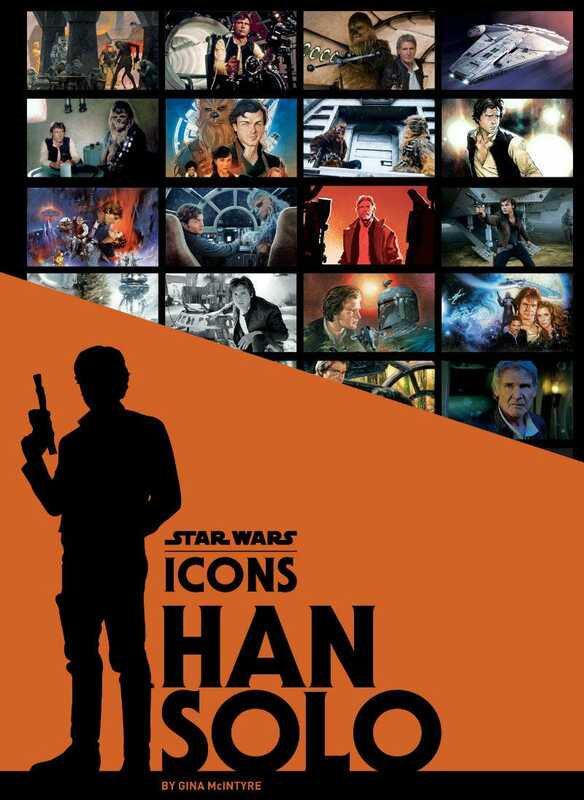 Page 96 in Star Wars Icons: Han Solo. 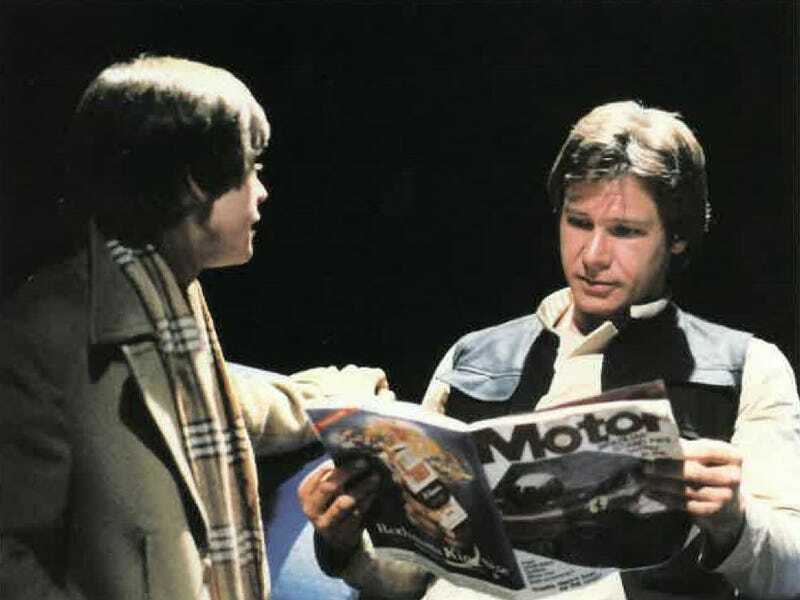 Here’s a wonderful photo of Ford reading Motor magazine on the set of Return of the Jedi. Just Han Solo. Reading a magazine. 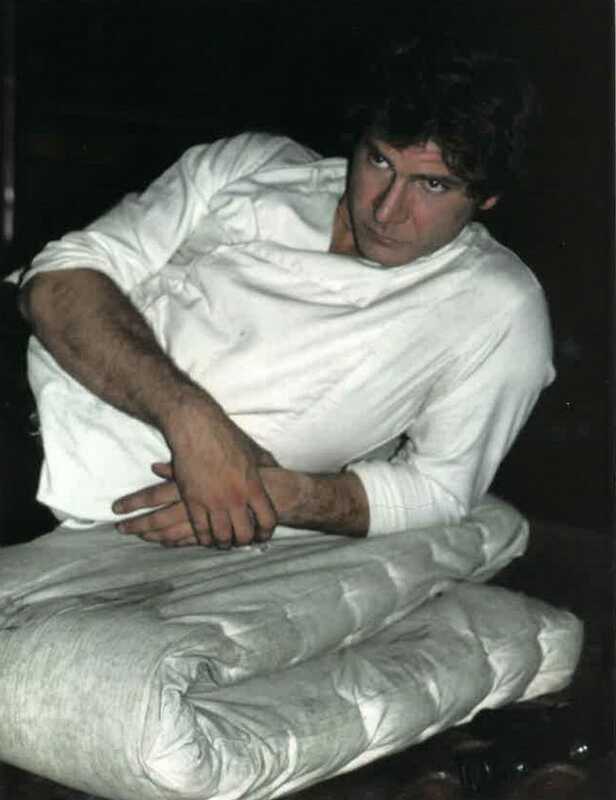 A photo from page 114 of Star Wars Icons: Han Solo. Post Jedi, the book gets into Han’s life in the Expanded Universe. Here’s a fold out of some Drew Struzan artwork from those books. 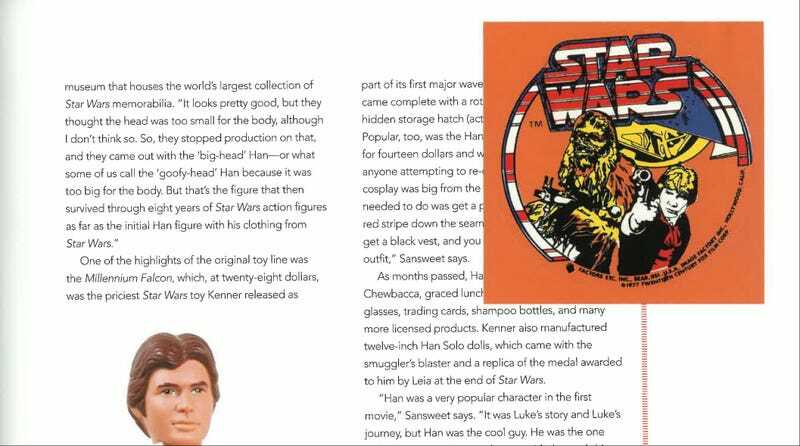 Page 125 in Star Wars Icons: Han Solo. Sure there are extensive chapters on Star Wars returning, The Force Awakens and even some The Last Jedi (though Han isn’t in it). 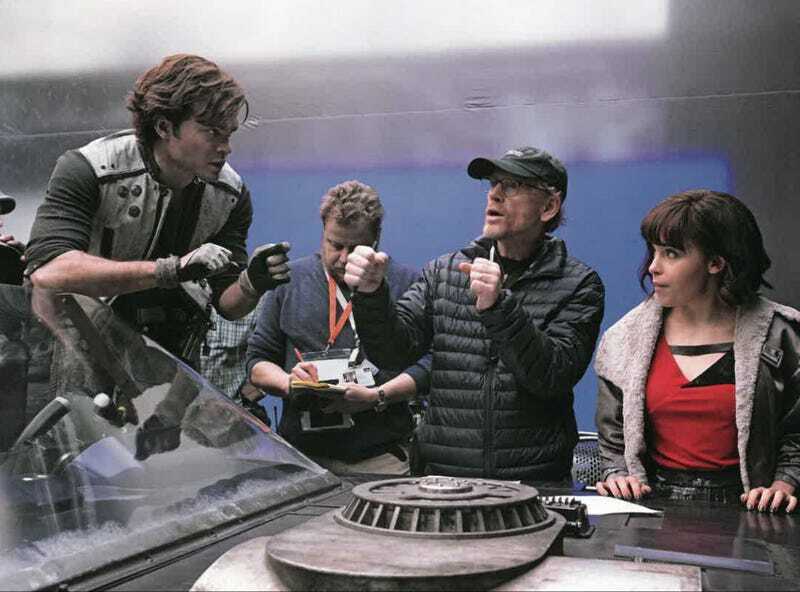 But the book has a really great section on Solo, including these behind the scene photos I hadn’t seen. A photo from page 214 of Star Wars Icons: Han Solo. And another one with director Ron Howard. A photo from page 222 of Star Wars Icons: Han Solo. There’s even a replica of the pass attendees of the Solo premiere were given which, again, can be removed from the page. From page 235 of Star Wars Icons: Han Solo. And then, like a final cherry on top, the inside back cover of the book has an envelope on it. And inside that envelope is this beautiful artwork. 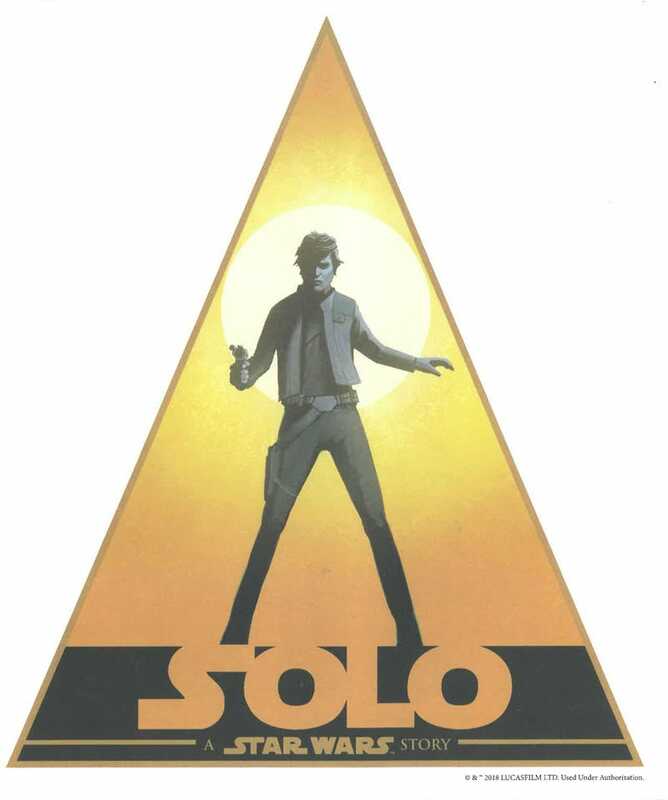 Artwork in Star Wars Icons: Han Solo. As you can imagine, that’s just the tip of the blaster. The book gets into controversies like Greedo shooting first as well as the questionable way The Courtship of Princess Leia explained their marriage. As for more modern issues, such as L3-37 being put into the Falcon or directors Phil Lord and Chris Miller being fired from Solo, the former is mentioned in passing and the latter not at all. You can very much tell this is an official, authorised telling of this whole story. And yet that’s okay. The book is tactile. It’s interactive. And it’s fascinating. Below is the cover and you can get your hands on it April 2.